Holland had no "south"? I can't beleive that, where would the north end? Indeed, or at least, not so as you'd notice. Same goes for North-Holland. And for trying to be clever, tell me where South-Brabant is. You can find North-Brabant on those maplets above. Is it like looking for East Virginia in the USA? :-) No, I was inetnding to say, that before 1812 there was no "South-Holland" to come from. But well done for Creative Misunderstanding. And for trying to be clever, tell me where South-Brabant is. You can find North-Brabant on those maplets above. Or 'ici' if you prefer. Since the Belgians have their own hang-ups about language they have sort of split it up in a Flemish and a French speaking part. It comes from all having been part of the 'Low Countries' (which name is still in common use referring to aviation charts). 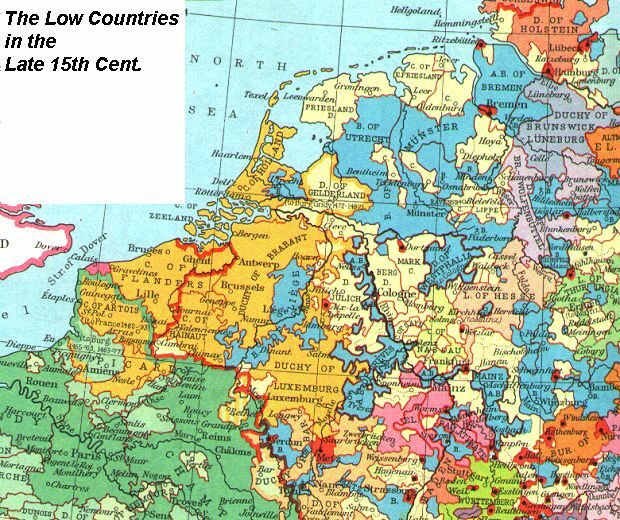 This one nicely shows the former Duchy of Brabant. No need to overdo it, although I found them interesting. But your penance is fullfilled, you're forgiven, and may leave the penalty-box. And there are of course enough other Quite Interesting NetherRegion bits. Mosey on over to the Green Room,where you will find a lively thread nuder the heading of: "Will Master Fry please opint out this "Holland" of his?". But you're right, this was not an instance of misure of the name Holland for "the Netherlands', that you did elsewhere. Twice. Where can I put my face. I can only offer up as an explanation, that I had slept for about 5 minutes in total for the last three days, due to the oppresive heat. Still am rather wrnug out, though I went for a nap yesterday 1:15 PM and woke up a quarter past midnight. The rest of the night I didn't sleep, naturally. So much so, it was a full stop....well, I assumed he stopped moving and so on. ... a full stop....well, I assumed he stopped moving and so on. Well, at least a semi-colon. I was lucky enough to have my hart and lungs not stopping. Or so I assume, I'll have to wait to see if things start smelling badly (cue Egg thread) and dropping off to be sure, of course. But I've done better, once.